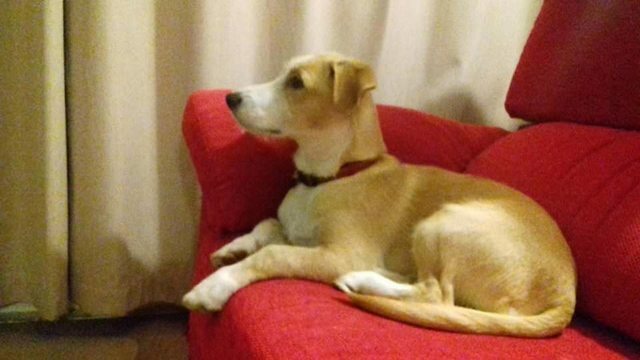 Billy is a 6 month old male Cross-Breed boy being fostered in Birmingham in a family with home with 4 other dogs, a cat and teenagers. He is only medium size reminds me of a Corgi sort of size and shape. 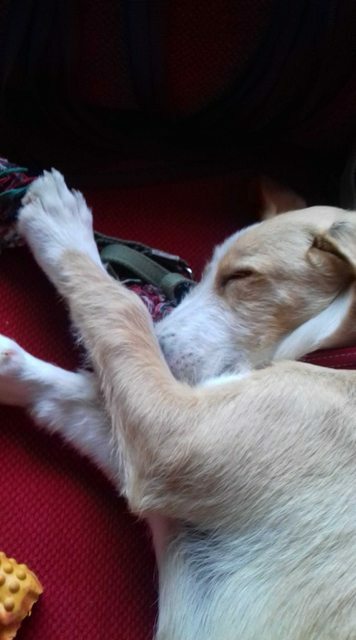 This lovely boy came into rescue in Spain unwanted by a Spanish family with his dad, mum and brother – his dad and brother are now rehomed and doing really well and his mum will join us shortly. Billy has settled well into family life, after living in Spain where he lived a quiet life with his siblings he found the big wide world a little scary – but under his foster mummy’s care he is getting braver – when he first meets other dogs he can bark, there is nothing aggressive about little Billy he is just scared but this has improved so much in the short time we have had him and gets better every day – he has now made some new dog friends up the park and as long as they are not too over the top and give him a bit of time he soon enjoys running around and playing with them. So whoever takes him on just needs to continue with what his foster home has been doing so he continues to grow into a confident young adult. 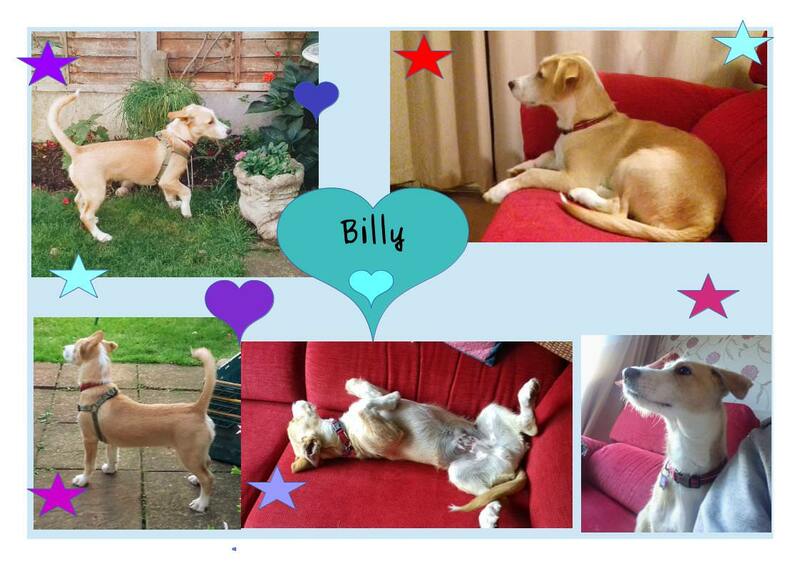 Billy is very friendly little dog, pretty easy to live with, has his mad puppy times like all puppies and gets on well with the 4 dogs he is being fostered with although we think he finds them a bit boring as they are all older. We have homed his brother and dad both of which are doing great in their forever homes – his dad is real little character in the feed back we get back and has a wonderful temperament. Billy could easily go and live in a family home as he is a very friendly puppy and seems to like children- would be fine with other dogs and cats, but would benefit from a dog that would not be too over the top with him as he is a real baby. He does need a family that has some experience to help work on his confidence out and about- we will continue to work on this but this needs to be sorted out now while he is young -he would also benefit from dog training, like all young dogs do to help them grow up into well rounded adults. Billy is too young to be neutered so you will be expected to do this as part of the adoption agreement. He is fully vaccinated, blood tested and has a Pet Passport. For further details regarding adopting a dog from Starfish Dog Rescue in Gloucestershire, please email Gilly at starfishdogrescue@hotmail.co.uk for our questionnaire if interested in any of our dogs. We will endeavor to get back to you within 4 hours. Starfish Dog Rescue is a small rescue helping the most vulnerable dogs/owners in UK and abroad. 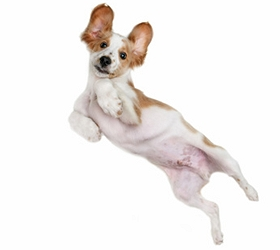 All homes will be vetted adoption fees are to help recover vet bills and travelling costs.